Coffee Talk: We should do this more often. We at the Unused Substitutes have a firm stance that Ottawa is one of the most boring teams to play against in North American soccer. Tampa Bay’s records against Ottawa side is underwhelming to say the least and matchups with the Canadian side typically end in frustration. But if Saturday’s scoreline is the way this series is heading in the future, we can get behind it 100 percent. Lot of firsts in this one. It’s the first time the modern Rowdies have beat a team by five goals in the modern era. Marcel Schäfer earned his first assist of the year. Joe Cole grabbed his first goal. Matt made it to his first match of the season. Just like we didn’t want to linger on last week’s loss, let’s not do it on this week’s win either. It was a fun night but there’s a big test coming up next week in New Jersey. I was going to point to this game as an example of how these two clubs chose two different paths on entering USL, with Ottawa becoming Montreal’s affiliate, but they only started one player on loan from the MLS club. Rest of the roster has plenty of D-2 experience. If it feels like the local media attention being paid to the club is increasing, it just might be – spotted at last night’s match were Drew Garabo, Seth Kushner & John Senning from the top-rated Drew Garabo Live radio show on 102.5, as well as Holly from 101.5’s morning show, The Commish Justin Pawlowski (wearing an MLS2StPete shirt,) from the Bucs Uncensored podcast & Stick Carriers and Seth’s wife Phoebe, who runs the local Apple A Day charity & St Pete Legend. Despite the weather, it was a lot of fun at the @TampaBayRowdies game w/ @SethKush @RadioPhoebe @TheJohnSenning @RadioHolly & @CommishOnline last night. Thanks to everyone who said hey! Positives: So many places to start, but the biggest thing is the core chemistry starting to show itself. It was great seeing so many players get involved once we caught on fire in the second half. Negatives: Hard to find anything bad about last night, but as great as the second half’s barrage of goals and s was, it came after a very slow start. Against another team, a slow start like that could leave us playing catch up all night. The team showed great character coming up with such a strong overall performance following the disappointment in Louisville. But like Matt said, they can’t linger on this for long because we’ve got a tough test at NYRB II. Despite the great win, the Rowdies are displaying a worrying trend of giving up chances early in games. Against a better side, or if Mizell has an off night, we could have been down one or two early. Something the team needs to work on. 5 goals, 4 different goal scorers. This team is entertaining and dangerous. I’m enjoying watching what they can do. *Editor’s note: Dan hasn’t even fulfilled his obligation to chow down on some poutine to satiate our patreon supporters, but he’s already moving on to a more permanent commitment. He couldn’t hold out for a regular season or postseason title? The way things are going, feels like Leo and Georgi could get a hat trick any time play. Special shout out to Zac Portillos on his first professional goal. Battled his way back from separate Achilles injuries in his first two years as a pro and showed last night he has the hops to get up and finish this gorgeous header. Onua Obasi was shown a straight red for this and I wouldn’t be surprised for this to end up being a multi-match suspension. No excuse for that. Keep in mind Obasi was the one who delivered the nasty tackle that broke Eric Avila’s leg at the end of the 2016 season. You guys REALLY like soccer crests, huh? The numbers don’t lie. Mike Pendleton‘s guest post on why the Rowdies should implement a crest smashed every record for our site. In four days, that post has already gotten more views than any of our past posts and the day it posted is now the busiest traffic day in the history of the site. 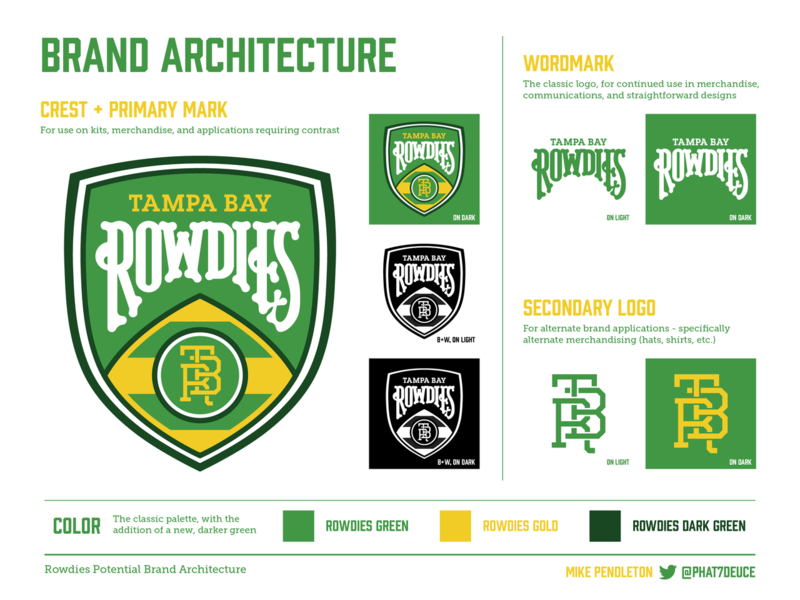 Mike Pendleton’s proposal for a Rowdies crest. Thanks to Mike’s inspiration, others chimed in with their own unique designs for a potential Rowdies crest. We’ll let them and their work speak for themselves. 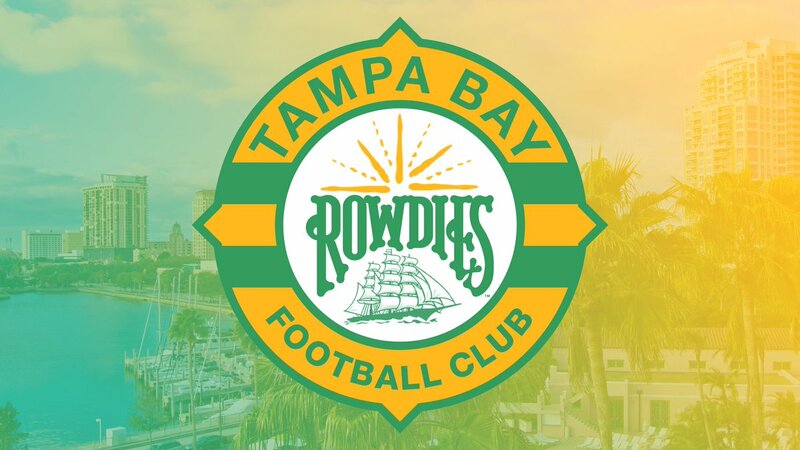 The Tampa Bay Rowdies Football Club brings a rich history of the international game to the Bay Area. Thus, developing a crest for one of the United States’ most iconic brands is no small task. The inspiration for my design is to instill a culture of success and to provide guidance for the Club, all while paying homage to those who came before us. The classic Wordmark is the focal point for the crest. A wise man once said ‘do not fix what isn’t broken’. However, I utilized the Wordmark to represent our Land. Our Game. Our Club. The ‘Ship’, south of the Wordmark, represents our journey as a club. With Al Lang Stadium as our oort, our adventure on the [Insert Badass Ship Name Here] will provide the Rowdies a platform to conquer the world. The Horizon, north of the Wordmark, represents the future of the club. The Sun brings life, energy, strength and power to the Rowdies. The Golden Compass is our crest plate giving the Rowdies guidance, as well as what we treasure most. The Crest will forever be worn over the Rowdies hearts so that even in the darkest storm, it will always point the Rowdies in the right direction. The hoops binding the compass provide strength to the Rowdies on their journey while also clearly defining their identity on and off the pitch.